AFC Leaders join with angry supporters outside Public Buildings yesterday in protest of President Donald Ramotar’s decision to prorogue Parliament. if the political opposition chose to go ahead with its no confidence motion against the Government. In the process he has infuriated the parliamentary opposition. The announcement of the proclamation by the President was greeted with threats of mass resistance, talk of bloodshed and a reminder of what happened to King Charles 1, when he prorogued his Parliament and was later beheaded. Speaker of the House, Raphael Trotman, called a meeting to order in the Chambers of Parliament and officially informed the opposition members of the Proclamation by the President. Several parliament staffers were in chambers; members of the public congregated in the viewing gallery to witness and listen to what can only be described as an historic announcement by Trotman. By the end of the session several of the political leaders met with their supporters who were still congregated outside of Parliament building to inform them of what had transpired and the way forward. Arriving at Parliament building amidst a throng of vociferous supporters, Opposition Leader, David Granger, told reporters that A Partnership for National Unity (APNU) will resist the President’s decision since the party viewed it as a denial of democracy. According to Granger, what obtained as a result of the decision of the President is a dark day for Guyana; it was completely unnecessary. Granger also accused the President of wanting to prevent the opposition from looking into the matters of his Attorney General, Anil Nandlall, as well as that of Finance Minister Dr. Ashni Singh, who is accused of illegally spending in excess of $4.5B from the nation’s coffers. Mover of the no confidence motion, Alliance for Change (AFC) Vice Chairman, Moses Nagamootoo, received a boisterous greeting by those who had gathered outside of Parliament buildings waving placards, beating drums and calling for the removal of President Ramotar from office. He joined in on the chorus “Ramotar must go” before commenting on the decision to prorogue the Parlaiment. A Day of Infamy and Shame (DIS), he said. Nagamootoo was adamant that President Ramotar by his action has ‘dissed’ the Parliament and by extension, the People of Guyana. He lashed at the proverbial olive branch that was issued by the administration, calling it ‘dry talk’ about negotiation. Nagamootoo was adamant that there can be no negotiations with Government when a dagger is being held to the throat of Parliament. Nagamootoo warned that the Government may have been motivated by a desire to spend public funds without any parliamentary scrutiny and to raid the treasury. Government, he said, has now put Guyana into the throes of an authoritarian state and Ramotar must revoke the proclamation in order to allow the representatives of the people of the country to decide on its future. Nagamootoo said that he would not be able to preempt what would be the response of the people to the outrageous act by the President. He drew reference to the scores that had gathered outside Parliament building voicing their displeasure at Ramotar’s proclamation. WPA Leader, Dr. Rupert Roopnaraine, who was also on hand for what was thought to be a debate and vote on the no confidence motion, also expressed his disgust at the decision of the President. All 33 members in the opposition benches turned up ready to debate and vote the motion of no confidence, intent on removing the Government, but Ramotar has effectively pulled the brakes on the opposition’s wishes. 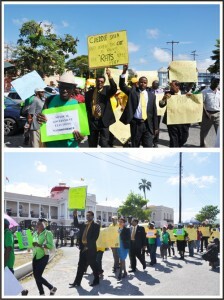 Ranks of the Guyana Police Force were out in their numbers as supporters of both AFC and APNU converged outside of Parliament buildings bearing placards emblazoned with slogans such as “yes for a good life; call elections now; yes democracy no dictatorship and Anil must go, among others. AFC leader Khemraj Ramjattan, also joined those converged outside of Parliament building with his placard and other executive members. The sitting of the House was scheduled for a 14:00hrs start but following the proclamation by the President there were several impromptu meetings being held among opposition members strategizing on a way forward.